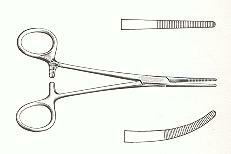 The Kelly Hemostat is a Forceps is available either curved or straight, 5-1/2". It is stainless steel and floor grade which means it is for regular use, not an operating room. Imported. Quantity pricing available.